One of the fabulous contributors to issue one of The Paperbook Collective has just given me a fabulous idea. Ok, a lot of the time. 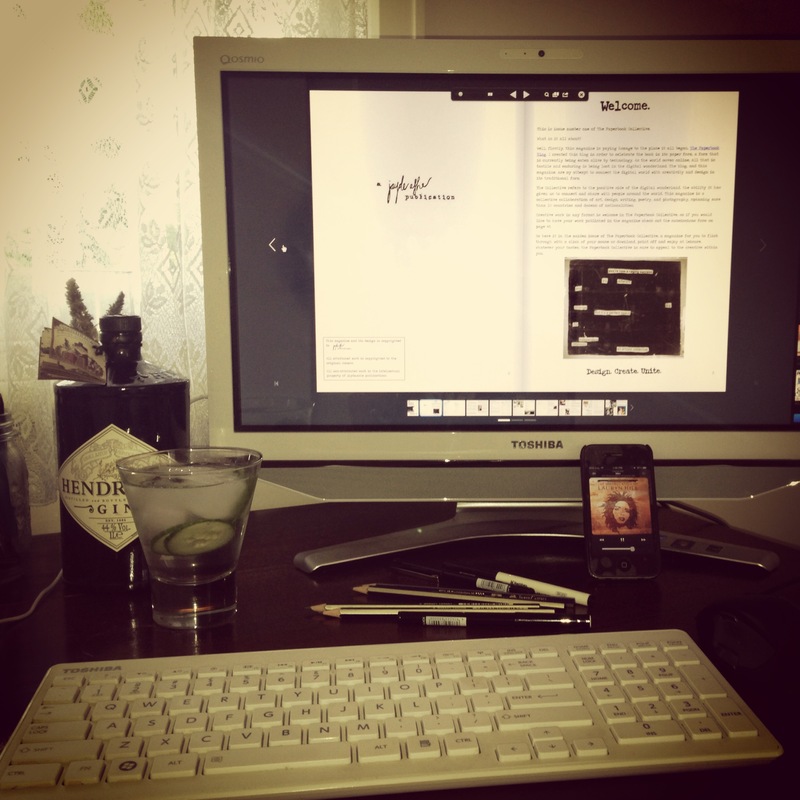 She emailed me the most incredible picture of The Paperbook Collective open on her computer screen. But it wasn’t just that, the picture also featured her awesome desk, the music she was listening to and her drink of choice. It is so amazing to think about this magazine being read around the world, but then I thought, wouldn’t it be even better if you could actually SEE it being read around the world? So this is where you come in guys. Include (if you can) the music you are listening to and your drink of choice. It doesn’t have to be alcoholic, if you love tea, juice, even good old water don’t be afraid to put that in there. Put yourself in the shot if you like, or don’t, either way is fine. Include your city in the email so we can see where the magazine is being read. Every single person who emails me a photo will be featured on the blog, and will include a link back to your blog. Have some fun and get some blog loving happening at the same time. The magazine doesn’t have to be open on the cover page, any page is fine. Contributors, have it open to your page if you like! Promote the magazine and your work at the same time. Get them in to me as soon as you can, I’d like to run the post early next week. Here is mine to kick things off and give you a demo. Please re-blog this if you can, so more people have a chance to be a part of something awesome. Sent! Great idea…will be fun to see all contributors! Hey around the world viewers of the Paperbook Blog! Check out the latest initiative from Jayde Ashe! Thanks for the re-blog Sahm and thanks for the great photo! No problem! Sounded so much fun, wanted to share. You’ve got mail 😉 sharing this on my FB Page. Reblogged this on Fredrik Kayser. Previous PostWrite Drunk. Edit Sober.